Extreame Savings Item! 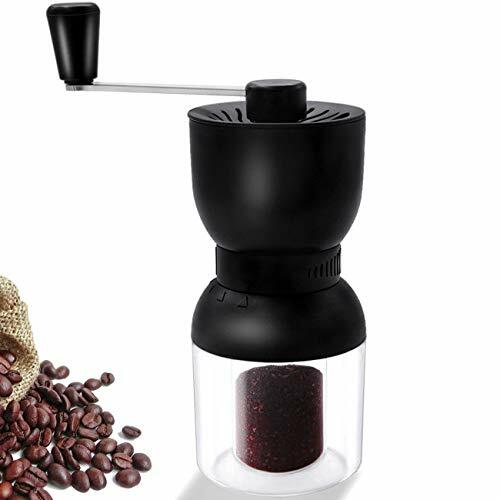 Save 42% on the Coffee Grinder Manual, LHS Ceramic Coffee Mill with Fine Conical Ceramic Burrs Black,2 Size Clear Glass Jars Infinitely Adjustment Nut Grind Removable Hand Crank Coffee Mill Quiet and Portable for Travel by LHS at Rat Coffee Shop. MPN: YKLKFM-01. Hurry! Limited time offer. Offer valid only while supplies last. We LHS, with NSF Approval,passed BSCI,SEDEX,WCA factory audited.Awarded with ISO14000,ISO9001:2015 and ISO22000. Complying with the LFGB and FDA stand. 1.Please remember to dry it well before reassemble the parts. 2.Be sure to use fresh, dry beans. Step 1: Add coffee beans to the grinder. Step 2: Rotate the handle clockwise. Step 3: Open the lid and remove the coffee powder. Step 4: Make a cup of fragrant coffee. ●This machine can be dismantled and washed, wipe dry before installation. Especially for Bearing and Burrs. ●Please avoid children operating this machine for it contains sharp parts, pay attention to preventing scraping. ●Be sure to use fresh, dry beans to make a delicious coffee. ▶HIGH QUALITY: Manual Coffee Grinders made with ABS, ceramic, stainless steel parts. Compared with a ceramic burr, infinitely adjustment nut with temperature stability, never rust, enhancing durability. ▶SUPER QUIET: This coffee grinder significantly less noise than electric grinders with the super fine premium large ceramic burr which means you can enjoy fresh hand ground precision coffee and drink a pour over, french press, turkish coffee brewing every time. ▶EASY TO USE: Coffee bean grinder can be adjusted from ultra fine to coarse as you like. Just simply rotate the part to make a coarse or fine coffee powder for brewing.The removable portable hand crank make it possible to drink a handmake coffee on travel. ▶EASY TO CLEAN: The manual coffee grinder can be easily split into small parts. The whole body washing just needs to be washed easily separately under running water without coffee residue. ▶GUARANTEE: LHS coffee grinder with 2 size storage jars, will not only provide you with a delicious coffee but the spice herb pepper mill with professional grade ceramic burrs. If there are any problems, please free to contact us, we will reply to you within 24 hours, make sure to give you a satisfactory solution. If you have any questions about this product by LHS, contact us by completing and submitting the form below. If you are looking for a specif part number, please include it with your message.